Miss Bates can’t tell if it’s something in the air, but this is the second second-chance-at-love romance she’s read this month. It’s not a favourite trope (hello! marriage-of-convenience 😉 ), dependent as it on filler-back-story, but it does have richness potential. 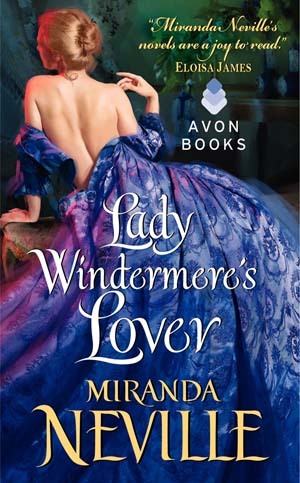 Neville’s latest London-set Georgian romance, Lady Windermere’s Lover, did not disappoint. Though it wasn’t as perfect as Ruin Of A Rogue, Miss Bates read it in one sitting because, even imperfect, Neville’s characters and the unfolding of their relationships engage Miss Bates emotionally, the tried-and-true test of any romance worth its mettle.